Malcolm Toft's latest brainchild enables you to turn your 500-series racks and modules into a fully modular analogue console. Malcolm Toft will be well known to many people in the audio industry as the man behind the revered Trident A-Range and Series 80 consoles, but his company Ocean Audio will be less well known — simply because they've only recently launched their debut products! Earlier this year, Toft departed from Trident for the second time to set up this new venture, and announced the development of a comprehensive range of 500-series equipment. The Trident company itself, owned by American distributor PMI, continues to produce and sell the classic Trident designs. When Toft sold his interest in Trident Audio Developments for the first time, back in the late '80s, he developed a new console which he brought to the market with a company named MTA (Malcolm Toft Associates). Essentially, Toft picked up exactly where he'd stopped with the Trident Series 80, adding a few "contemporary facilities", as he put it in an interview with Paul White in 1994. With Ocean Audio, Malcolm Toft is essentially offering adaptations of the MTA console building blocks for the 500-series format. The range comprises various modules, which are reviewed here, and will soon include The Ark, a fully featured console that can accommodate many 500-series modules. Once that's available, we'll take a look at it too, but for now I'll focus on the modules. The four modules, which are surprisingly competitively priced, given their pedigree, can be considered in two categories. First, there are the 'front end' devices, the Mic Pre and EQ derived from the MTA channel strip; and then there are the 'back end' devices, the I/P and O/P modules. It doesn't matter whether you're using one module individually or all of them in conjunction, as these building blocks are very versatile units, offering plenty of features and options. Very few corners seem to have been cut in the design stage, and the result is a palette of 500 modules that do not seem, to me, to skimp on any critical functions. The Ocean Audio 500 Mic Pre offers 60dB gain and a variable high-pass filter, and it comes with transformer-balanced inputs and outputs. The 500 Mic Pre is able to amplify all kinds of signals. It can deliver up to 60dB of gain for mic-level signals, and up to 36dB for line signals. This may not be a record-breaking specification, but it should be plenty in most real-world situations. There are two individual pots for adjusting the mic and Hi-Z/line levels. 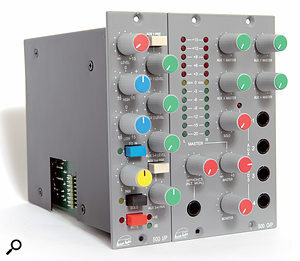 In addition to the usual I/O presented on the rear of your host 500-series rack, this module sports a high-impedance input on the face plate, and this can be used to connect instruments such as electric guitars and basses. It almost goes without saying that the 500 Mic Pre offers the basic necessities such as +48V phantom power and a polarity-invert switch. Toft has treated every switch to an individual status LED, and this is a very important feature for me: the status lights allow for failsafe operation even in hectic and dimly lit recording situations (have any of us not encountered quite a few of these in our careers? ), and too many manufacturers now seem to skimp on them. The 500 Mic pre also offers a 12dB/octave high-pass filter, which can be activated with a switch and allows for adjustments over a fairly wide range of 30 to 350 Hz. This makes it a really versatile tool, which may be used not only for simple filtering of subsonic noise, but also to alter the sound of a signal quite dramatically. Level metering is provided via a pair of LEDs, which is certainly enough to give a coarse idea of the output level, but at the same time it's the only aspect of this design where I wished for a little more — particularly given that it seems as though there is space available on the faceplate to accommodate a few more LEDs. 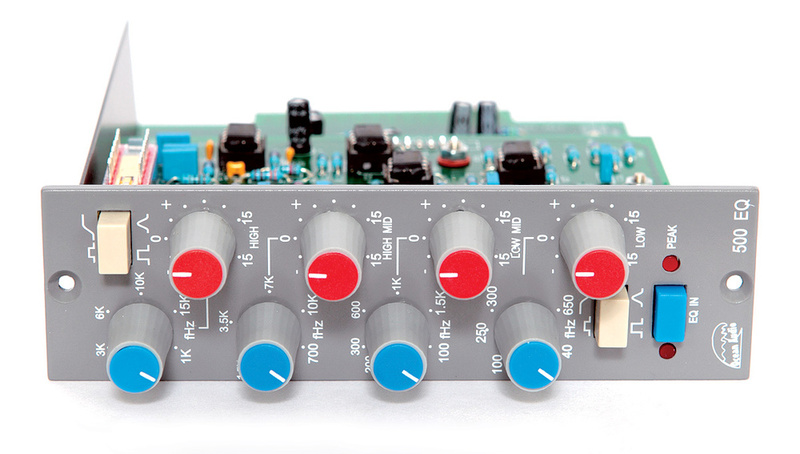 With four semi-parametric bands, the 500 EQ module is an iteration of the Trident Series 80B EQ, and its layout is quite similar to the current SSL and Great River Harrison 32EQ equalisers. Each band features fully sweepable frequency and gain (±15dB) potentiometers, the latter with a centre detent in the neutral position. All bands are overlapping, which means that even the most complex of EQ curves can be achieved with this module. The frequencies range from 40-650 Hz (L), 0.1-1.5 kHz (LM), 0.7-10 kHz (HM) and 1-15 kHz (H), and the two outer bands can be toggled between peaking and shelving characteristics. A bypass switch with a status LED and another peak LED round off the feature set of this module. Ample sound-sculpting capabilities: with four semi-parametric bands, the Ocean Audio 500 EQ is a classic studio workhorse. Despite their abundant feature sets, the Mic Pre and EQ are pretty conventional tools, which compete with literally dozens of 500-series offerings, but Ocean Audio's other two modules boast almost unparalleled facilities — because they can turn any 500-series frame into a versatile mixing console. Any number of I/P (input) modules can be combined with a double-width O/P (output) module. 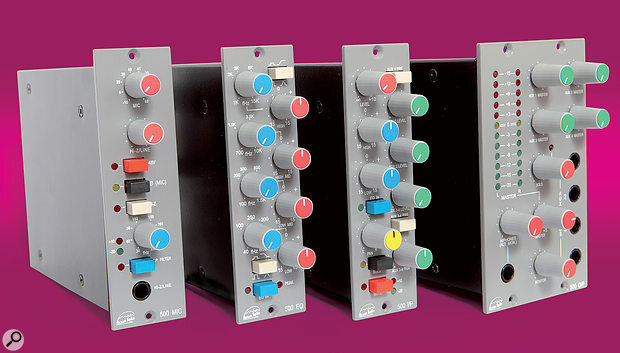 The I/P and O/P modules are connected with ribbon cables, which can be provided at any length, so that modules mounted in several frames can combine to form a large mixing/summing system. The I/P can act as a pretty versatile line-input module, with level (-∞ to +10 dB) and pan pots being the main controls. In addition, a two-band, Baxandall-type EQ can be switched into the signal path. Both bands offer a gain range of ±15dB on their centre-detented pots, and their corner frequencies are located around 80 Hz and 12 kHz. However, the I/P module offers a lot more besides, including solo and mute switches, as well as a versatile auxiliary send section. Aux 1 and 2 are mono sends, and their levels can be adjusted individually, whereas Aux 3 and 4 act together as a single stereo send with its own dedicated, centre-detented pan pot. To make matters even more complex, both Aux 1 and Aux 3/4 can be switched pre and post output level, and the module also offers additional routing options via the rear male XLR connector. Normally, this acts as a direct output, which can be set pre or post level control and mute, using an internal switch, but via another internal switch it can also be converted into an unbalanced insert path. All these signals (input channels, aux sends, mute and solo busses) are combined in the O/P module, which acts as the centre section of a console, providing summing, monitoring and metering facilities. There are individual master, monitor and solo-bus level controls, and the O/P module also boasts a headphone output with its own level pot, which may also be used to feed an amp or pair of active monitor speakers. On top of that, there are four Aux master controls, as well as four balanced TRS connectors for the Aux sends on the face plate. Metering is provided via two LED chains with 12 segments each for both output channels. Looking at the internal circuitry, it becomes evident that the entire system has been designed by an industry veteran who made his mark as a designer/engineer in a wholly different era, when a mass market for studio equipment barely existed, and when reliability was arguably more important than today. All modules have been constructed employing conventionally soldered 'through the hole' parts, and all op-amps are fitted in individual sockets. This construction, which employs only standard components, ensures reliability as well as long-term field serviceability. 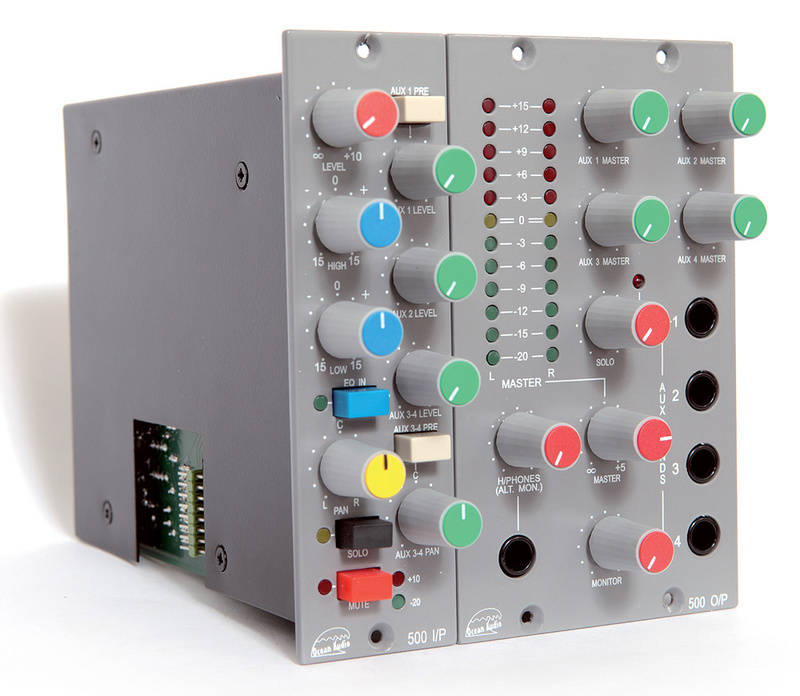 Flexible routing options: multiple I/P modules connected to the O/P master section can form a powerful 500-series mixing/summing system. As with the Trident 80 Series, there are no discrete Class A sections; the entire system relies on IC-based amplifier stages. Apart from the first stage of the mic preamp, where an OPA2134 is used, all active stages of the Ocean Audio range employ the ubiquitous TL072 op-amps. 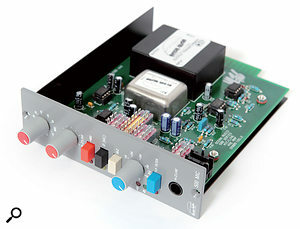 All inputs and outputs are actively balanced, but the Mic Pre is the only module in which audio transformers come into play. Both its mic input and output are transformer balanced via custom-designed units manufactured by OEP (Oxford Electrical Products). The entire system appears to be well constructed, and all controls feel sturdy and reliable. Although it's pretty evident that most of the actual engineering and manufacturing costs have been spent on functionality and circuitry (there are no milled metal knobs or faceplates, for instance), the modules actually look very nice, and not at all 'cheap'. I talked to Malcolm Toft about this at the recent Musikmesse show, and he seemed to take pride in the fact that he was able to offer the modules at such competitive prices without having to cut any sonic corners. Summing this up (pun intented! ), the modules may not appear as aesthetically opulent as some 500 series offerings, but they should offer reliable operation for years to come. It doesn't take much time to get used to working with the Ocean Audio 500 Mic Pre and EQ. Both offer ample facilities and are laid out in a straightforward way. They're true console input channels in the best sense of that phrase. The more coloured a console input sounds, the less flexible the entire system will be, and anyone familiar with Trident and MTA desks will agree that although these consoles certainly put their own stamp on a sound, they work well with a variety of sources. The Ocean Audio modules continue in this tradition. Sonically, the preamp is not what I'd describe as warm or full-bodied. Instead, sharing the tonal characteristics of the Trident series 80B preamplifier, it sounds rather bright and mid-forward, providing a present, powerful, yet rather tight and slender signal. These qualities make the 500 Mic Pre an ideal preamp for rock productions in general, and particularly for any sources that will need to cut through a dense production. You won't find yourself doing a lot of carving in the lower mid-range to make a signal fit in the mix. Instead, at times, you might wish to add a little weight and warmth on certain sources — and this, of course, is when the 500 EQ comes into play. As my audio examples (/sos/jul13/articles/ocean-audio-500-media.htm) show, Toft's new equaliser is not just great at subtle frequency corrections; it can also be used to make some pretty hefty adjustments. In a similar way to the preamp, the EQ always sounds precise, tight and focused, and even when used 'on full throttle', the sound hardly ever goes overboard. It reminds me in a way of SSL's EQ — although that's no surprise, really, as the solid-state Toft and SSL designs share as many similarities as they display differences. Getting used to the mixing system based on the I/P and O/P modules is a little harder. That's not because they weren't designed well, but simply because they offer facilities that we've not previously seen in the 500-series form factor. This system seems, to me, to cover the middle ground between a pure summing amplifier and a fully featured console (such as The Ark). Mixing in the 500 system might not be for everyone, but should one wish to set up such a rig, Ocean Audio now offer a clean-sounding system with surprisingly comprehensive routing options. There are certain inherent limitations in the format that a designer of such an ambitious system has to contend with, such as the limited number of connectors on the rear of any 500 frame. Some manufacturers, including Radial, tackled this by creating their own 500-series frames with additional routing/summing facilities and rear-panel 'Omniports'. Others, such as AwTac, have created simple bussing systems to sum channels together. With the Ocean Audio system, though, Toft has opted to make his modules compatible with any standard 500-series racks, while providing many more routing options. This approach has its plus points in terms of versatility and interoperability, but the module costs can soon add up, of course, and your 500-series frame real-estate can be eaten up rather quickly with higher channel counts. For instance, a full centre section, consisting of the O/P module and four I/P modules for the aux returns, already occupies a full six-slot Lunchbox! During the course of my review tests, I asked Ocean Audio about the possibility of creating a dedicated aux return module, to help save costs and module slots, and they agreed that this might be a worthwhile addition in the future. Given the quality of both sound and construction, all these modules are a steal at the asking price — especially when you consider that Ocean Audio's products are hand-crafted in the UK. Just as I'd anticipated, both the Mic Pre and the EQ modules have proven themselves to be really versatile and useful tools over the few months that I've had the opportunity to test them. The mixing/summing system, though, is something that's rather more special. It opens up a whole new world of possib ilities in the 500-series format, and enables you to build and expand a high-quality mixing system in a piecemeal fashion. In a Sound On Sound interview with Paul White almost 20 years ago, Malcolm Toft remarked that: "I still believe that there's a lot of life left in analogue consoles, and that they will be able to compete with digital consoles on both price and performance for some time to come." Two decades on, his philosophy and belief clearly remains intact, and it's a belief shared by plenty of others. What has changed is the way in which the technology found in analogue consoles is integrated into a modern studio facility, and the ways in which it can be combined to suit modern users' desires to mix and match gear to taste. When you look at these new Ocean Audio products in this context, they start to make a lot of sense. Malcolm Toft's very own Trident Audio Series 80B dual channel strip, albeit a 19-inch unit, has a similar feature set and sound to two pairs of Ocean Audio Mic Pre and EQ modules, and carries a similar price tag, too. In the 500-series realm, the IGS Audio Vanad 500 Preamp offers a similar topology with IC-based amplifiers and transformer-balanced inputs and outputs. 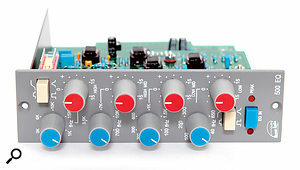 The SSL 611EQ and the Great River Harrison 32EQ boast four semi-parametric EQ bands, just like the Ocean Audio 500 EQ. Both the SSL and Great River Harrison are more expensive, but they also come with additional sets of high- and low-pass filters. At the moment, Ocean Audio's I/P and O/P modules do not have much competition at all. Some 500-series frames, such as the Radial Engineering Workhorse, offer routing and summing facilities, but while there are some basic summing systems, such as that based on AwTac's double-width preamp, no other option based on the 500 standard comes close to the flexibility of the Ocean Audio system. The limited metering facilities of the 500 Mic Pre. Each of these four modules offers an abundant feature set and is priced competitively. Very few corners seem to have been cut in making the designs fit the 500-series format, and many features of the Ocean Audio modules highlight Malcolm Toft's considerable experience and attention to the tiniest of details. The 500 Mic Pre and EQ are very versatile and cater for a broad clientele, whereas the mixing/summing system based on the I/P and O/P modules will appeal to a more specialised market. 500 Mic Pre £369; 500 EQ £369; I/P £299; O/P £499. Prices include VAT. Ocean Audio +44 (0)1626 650 017. 500 Mic Pre $649; 500 EQ $649; I/P $499; O/P $849.